** This post may contain affiliate links, which means I may receive a small commission (at no additional cost to you) when purchases are made through links found in this post. Next up on our Sew Organized series are tips for organizing and storing quilt patterns, magazines, and books. We all have them, and we all need them. And they can get out of control very quickly! First, let's tackle the patterns. I shared this image last week when we talked about organizing tools and rulers, which are kept in the red magazine holders. In the white magazine holders on the top shelf I keep quilt patterns. These white cardboard holders work great for storing quilt patterns - both the printed ones I buy at quilt shops, and also PDF patterns and tutorials from internet. You can find similar magazine holders here on Amazon. Before I go on, I want to mention something. You know those PDF patterns that you buy and download online - either from a designer's shop or from Etsy or Craftsy? I recommend that you ALWAYS save a digital copy of every PDF on a hard drive somewhere. I have a folder on my desktop set aside just for PDF quilt patterns. As soon as I buy the PDF I save it to the folder and then I print it. It's handy to be able to easily find old PDFs and reprint them later if I need to. On the bottom shelf of that same cabinet I have this green three ring binder. In here I keep patterns that I need to keep referring back to over and over - like the Patchwork Quilt Along last year. I knew I would need to refer to these pages repeatedly throughout the year so I kept them handy in this binder in the section labeled "current." In here I keep the pattern for any other project I'm currently working on. That way I always know where to find it, and it prevents them from getting ripped or accidentally being used for kids' math homework. Please tell me that happens to other people too :). In the notebook there is also a section for notes. 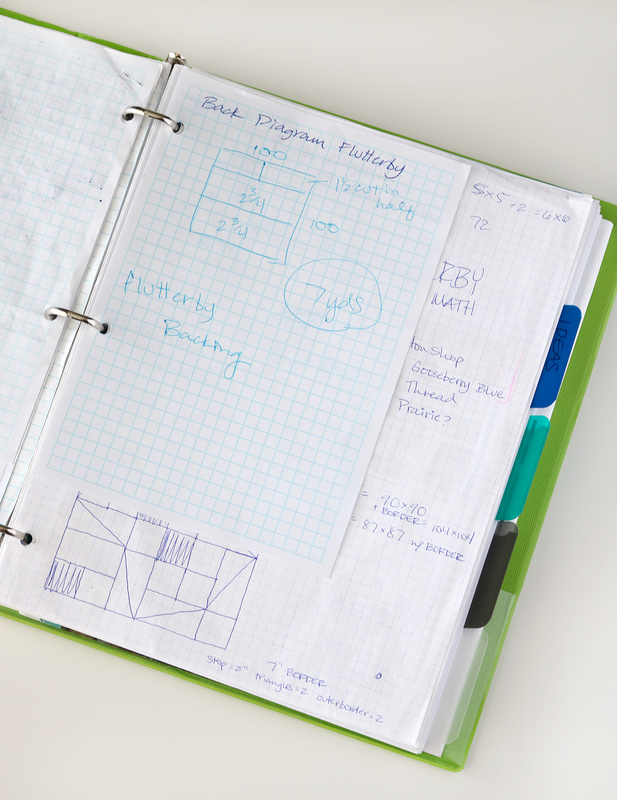 I'm constantly grabbing loose sheets of paper to make notes about re-sizing a pattern, how much binding to buy, or sketching up a diagram for piecing a quilt back like in the image below. To keep these loose papers from taking over my quilting space I keep them stored in here. I also have a section for quilt ideas and sketches of blocks to try. Sometimes I'll think up a cool idea but don't have time to draft it on the computer yet. So I make a sketch and a few notes and then file it here in this notebook. 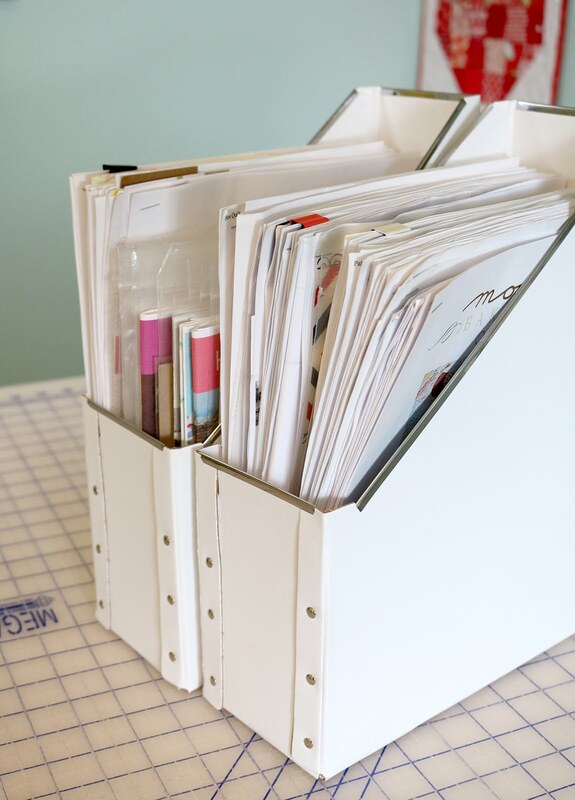 Another great solution for storing quilt patterns are these Mini Binders. You can find plain black or white ones like these, or there are also some fun colorful ones with designs. Find them here on Amazon, and Target carries them as well as most big box stores and office supply stores like Staples. The binders measure about 7.5" x 9.25". I love that you can easily view both the front and back of each pattern to see what the fabric requirements are without having to remove it! Because they're mini binders they'll fit almost anywhere - right now mine are on my smaller shelves above the ironing board. 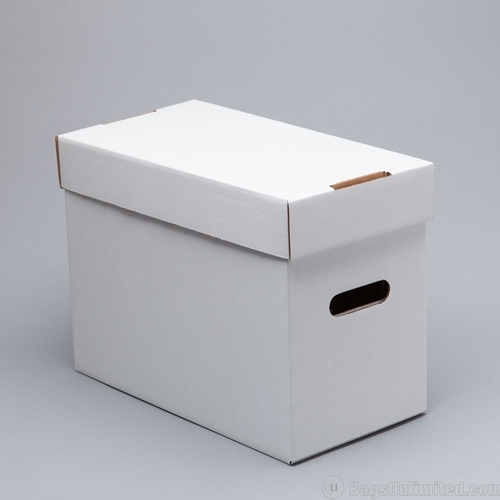 One more pattern storage idea are these boxes - they're originally designed for comic book collectors but they also happen to be sized just right for quilt patterns! You can find them here - and there's a few sizes to choose from. 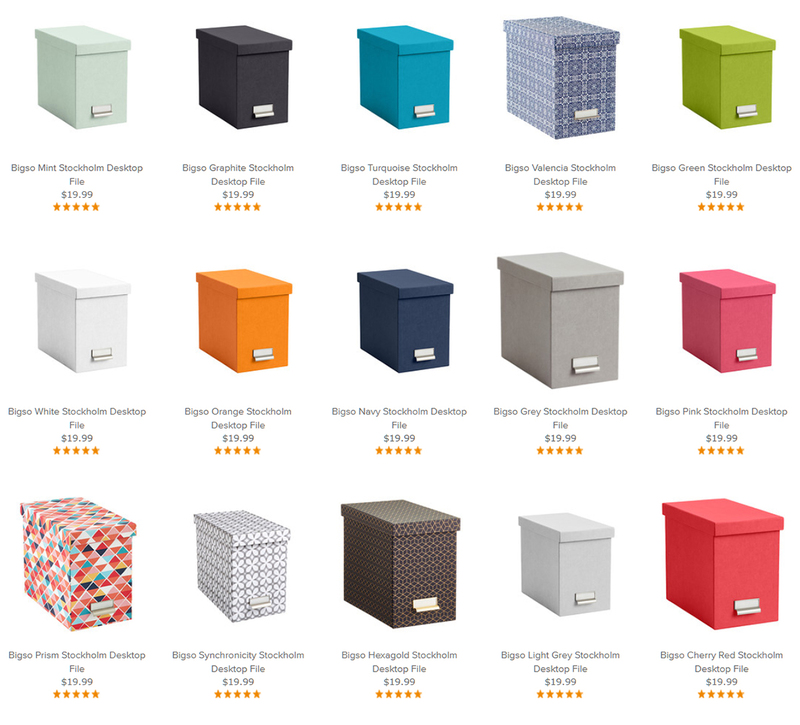 The Container Store has similar boxes - slightly smaller but they'd still work and they come in so many pretty colors! Alright - now how about those books and magazines we love? This is the other side of my cutting table. I have one shelf just for books - and I try to limit myself to just that one shelf. Right now they're pretty crammed in there but I do go through them every year or so and pull out any older book that I haven't used or don't think I'll use again. And that's ok! Styles change, your skill level will change and your interests will change. There's always great new books being written so it's okay to pass on your older books to make room for new favorites. From the ones I pull out, I'll offer them to to fellow quilters and take them to a local guild to see if there's anyone interested in them. I also have a shelf and a half for magazines. I need to go through them and pull out older ones so I'm just using ONE shelf again. Right now my magazine storage isn't that creative or unique - a magazine holder on a shelf works just fine, and there are enough magazines on the other shelf to keep them all snug and standing upright. In the next few weeks my plan is to go through the older magazines I have, tear out the patterns I want to keep and put them in page protectors in a regular sized three ring binder like this one. 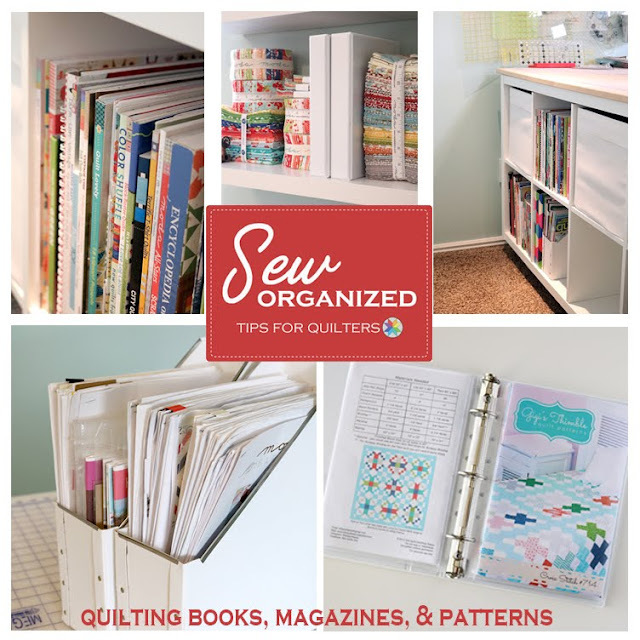 I really think that if they're stored this way then I'm more likely to make the quilts I want to - because I won't have to flip through dozens of pages to find that ONE pattern I wanted. 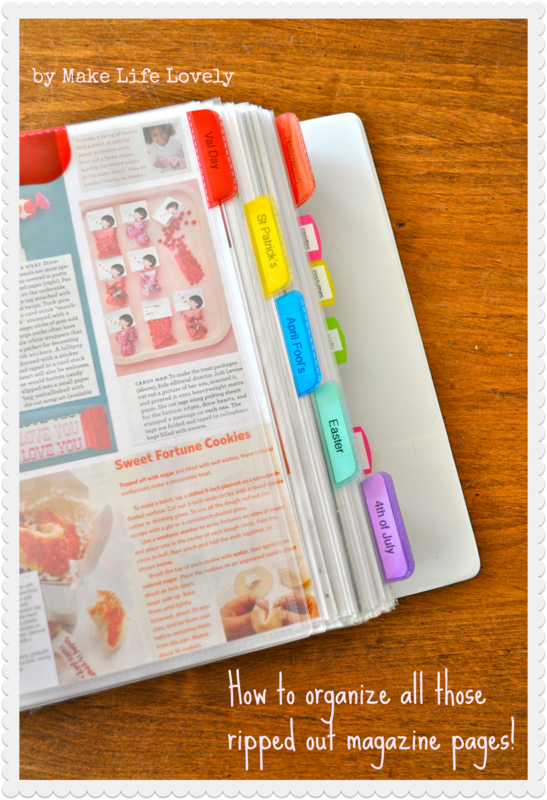 In this blog post by Make Life Lovely she shares how she saves favorite ideas from magazines and files them in binders. 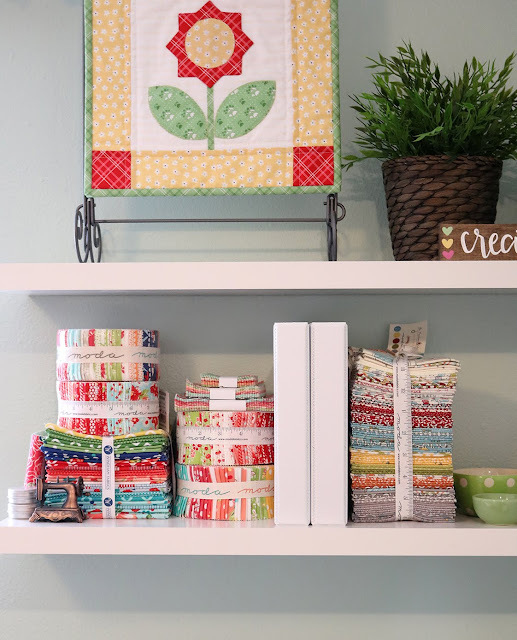 I love this idea and I could even organize the patterns by type (ie jelly roll patterns, FQ patterns) or by size (baby quilts, throw quilts) or even by type (applique, holiday, traditional, modern, etc). 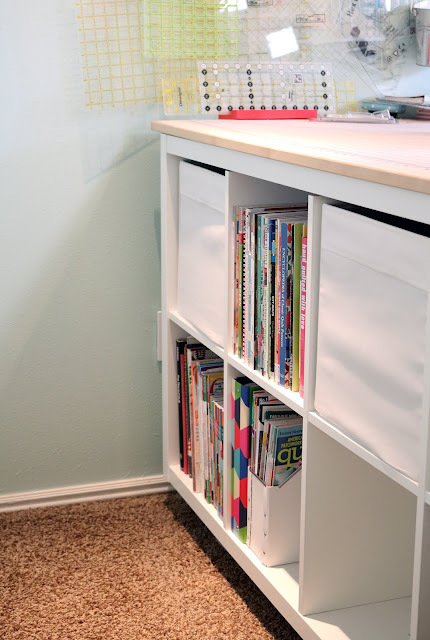 Another idea you could use for either magazines or books is a set of small shelves like these. I love that they put these shelves in this spot behind the door! This would probably be unusable space which then becomes a great storage opportunity with the addition of a few shelves. The shelves are from IKEA and you can find them here on Amazon. How about even more ideas? 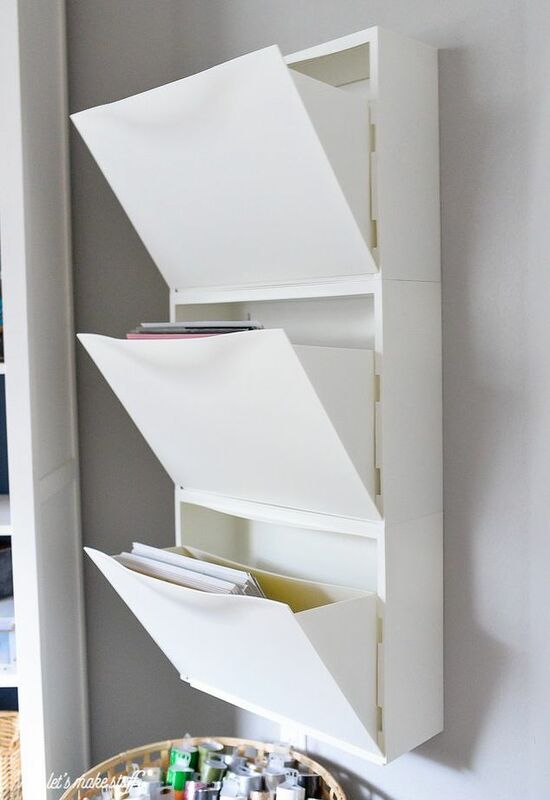 This is actually a shoe organizer from IKEA. 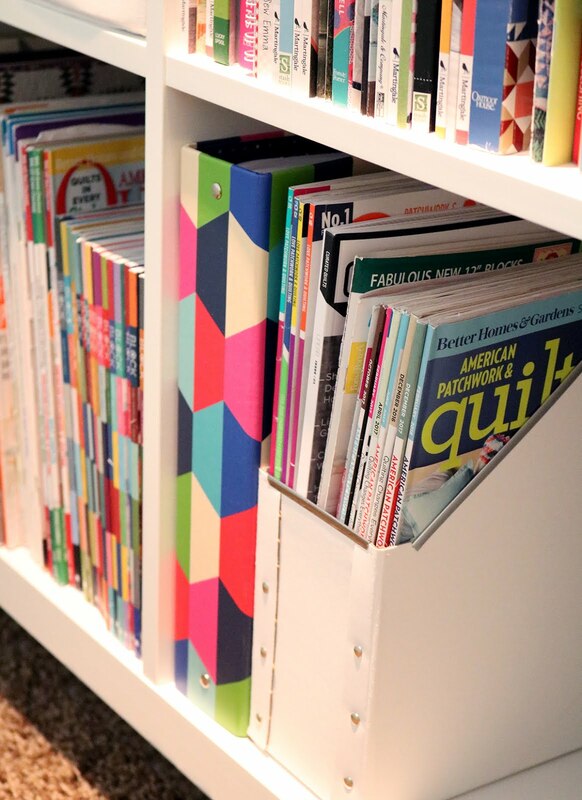 But I love the idea of using it to store notes, sketches, patterns, or magazines. And when not in use the pockets fold in and it looks nice and tidy. I can't take credit for this one - check out the original blog post from Hey Let's Make Stuff. 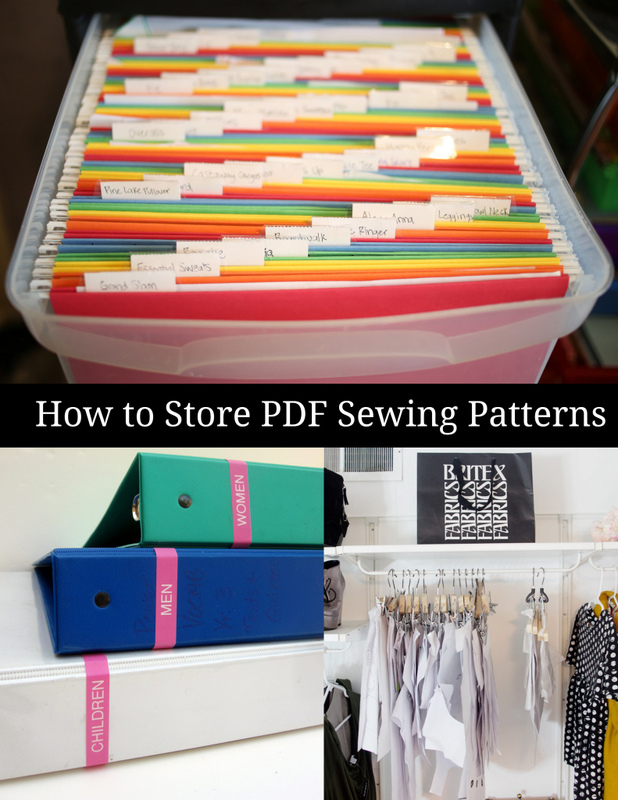 Peek-a-boo Pages did a whole post about storing PDF patterns and she has some great ideas. Check it out here. I love that hanging file folder idea in the photo above! Want even more organizing ideas? 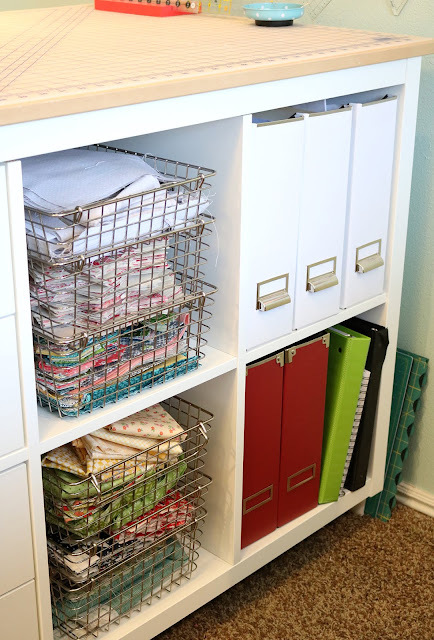 Check out my Sewing Room Organization pinterest board here. And be sure to follow, because I'll keep adding great ideas to the board as I find them! I'd love to hear if you have any tips to share! 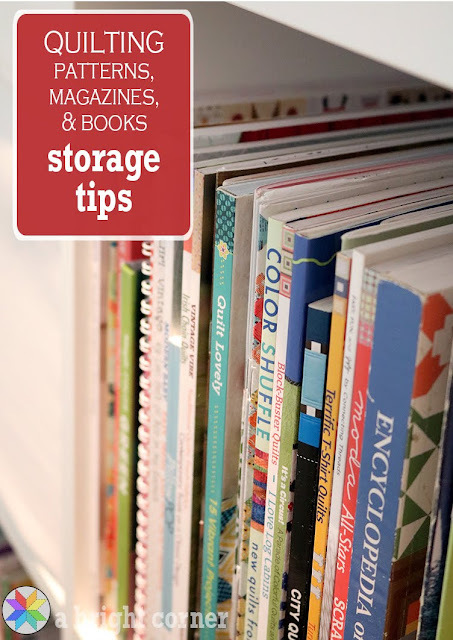 How do you store your patterns, books and magazines? Great ideas. 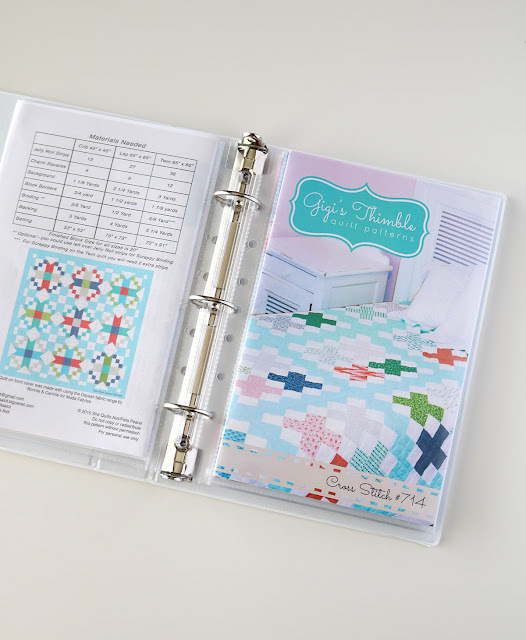 I store certain mystery quilt patterns in each their own binder. But the binders are one inch, and I could put two in each of them, instead of just one. My store bought patterns, I keep with the project, in a project box until it is finished. All others are kept in tall snap ware boxes with lids. They make some that are the right sizes for patterns. My books are in a book case outside my sewing room (OK, that's the plan, but right now a lot are still in boxes outside my sewing room). I have too many magazines, and I need to sort them. Some are in cardboard and plastic magazine holders (I even confiscated the lock set boxes from when they were building my house (They are shaped just like the magazine holders). I love to read all of these ideas, and appreciate this blog series! 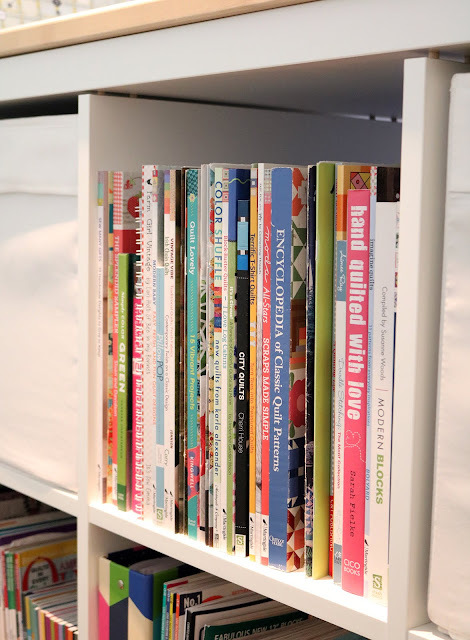 I have a hard time remembering what is in each magazine and book, and decided rather than to tear out the pages, as I had done for years with Knitting and Crochet mags, I made a sort of index/Pinterest binder. 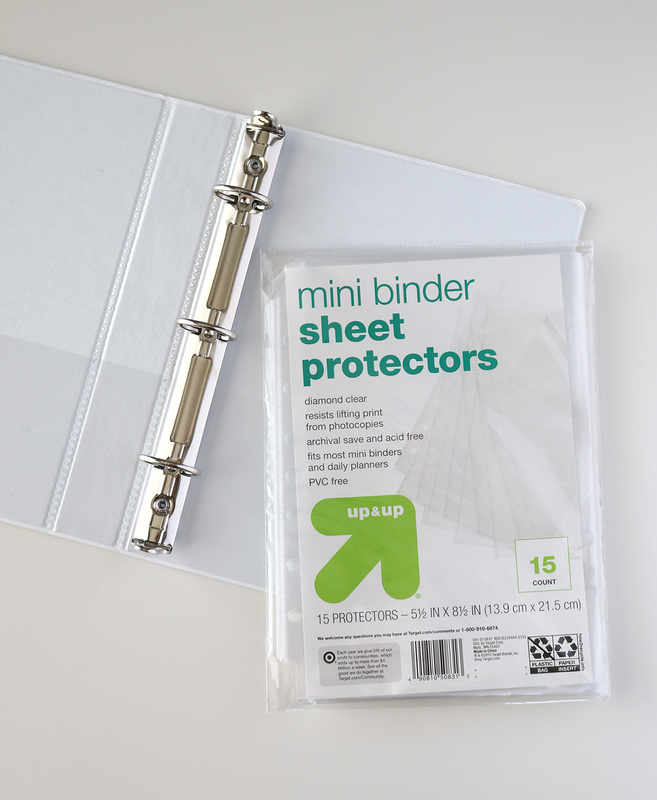 (Those old school supplies of binders and page protectors sure do come in handy!) When I want to save or make note of a pattern in either a book or mag, I take a photo of the project images on the page, and 'paste' that photo into a Word document. I do this for as many as I currently have, and print the images when I have full pages. I then cut the images apart, and tape them to a new sheet of paper, a little thicker (Neenah 65 lb paper I get at Walmart or Target) - each pattern and images to one sheet. Then I hand write notes on the new paper, with the name of the pattern, designer, source and page number at the top. Finished size, yardage/pre-cuts needed, and any additional notes I would want at a glance also go on the sheet. Then all of these go into a 3 ring binder. I have tabs separating the classifications of patterns that make sense to me. 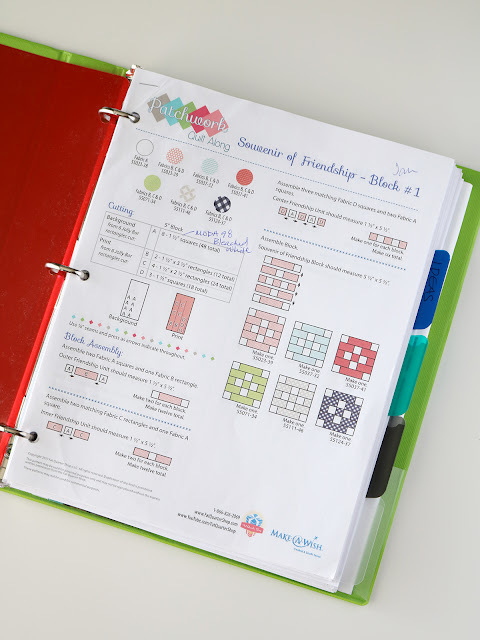 Now I have one binder that I can flick through, seeing quickly the patterns and sources. I also take photos or copy images I find on the web (google, instagram, etc) of different versions/colorways of the same pattern, and those all go together on one new 65 lb sheet as well, with the pattern noted at the top. This is what is currently working for me. Currently, anyway! Love these ideas! I just ordered a mini-binder and page protectors. For a fun way to store your rulers/tools with holes in them, Hobby Lobby had large (at least three feet) initial-shaped peg boards painted in bright colors. I got it on sale for $4.50!!! Now I have a coral-colored "D" with my rulers and tools on it.